Remember growing up watching “Saved by the Belll”? If your answer is yes, you’re probably between 35 and 20. Outside of that demographic, Zack Morris, A.C. Slater, Screech and Mr. Belding are names that probably mean next to nothing to you. But, if you ARE from the “Saved By The Bell” generation, then you darned sure remember Dennis Haskins’ character, principal Mr. Belding. At this point, I stuck out my hand, gave him our Kappa Sigma grip and and stated letters only brothers of our order would know. Yep, it’s true! Mr. Belding is a brother of Kappa Sig! It’s way cool to meet new brothers, but even more awesome when those guys happen to be famous actors! 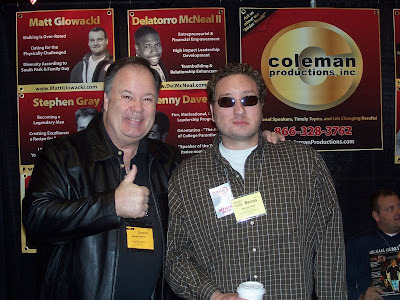 Here’s a shot of Mr. Belding and yours truly… who’d have thunk I’d be rubbing elbows with Hollywood types in Spokane?